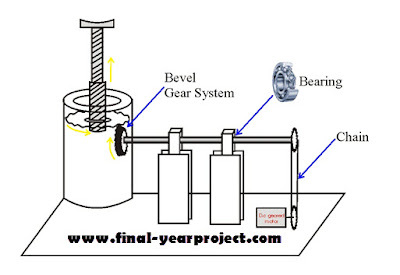 This is Mechanical project report on motorized screw jack. A jackscrew is a type of jack which is operated by turning a lead screw. It is also known as a screw jack, and is commonly used as car-jacks. The project uses a solar panel to power up the motor. This concept can be used in industrial purpose like cement factory, grain packaging and outdoor material lifting. You can also Subscribe to FINAL YEAR PROJECT'S by Email for more such projects and seminar. This project is run by motorised power, it can lift approximately 25kg weight. This project is useful for ladies and old age people who can’t change puncher Tyre when they are lonely on road. The report contains complete working of the project and component list to build this project. Use it for your reference and study work only.